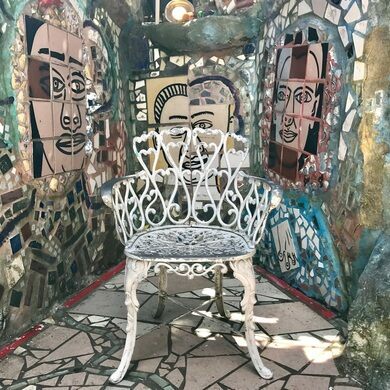 Philadelphia’s Magic Gardens make up a folk art center, gallery space, and nonprofit organization showcasing the work of mosaicist Isaiah Zagar, located at the site of Zagar’s largest public mosaic installation. 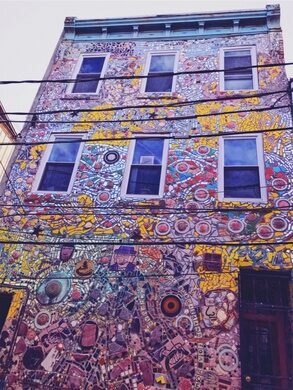 Zagar devoted himself to beautifying the South Street neighborhood in the late 1960s, when he moved to the area with his wife Julia. The couple helped spur the revitalization of the area by purchasing and renovating derelict buildings, often adding colorful mosaics on both their private and public walls. The first such project was Julia’s still-thriving folk art store, the Eyes Gallery at 402 South Street. 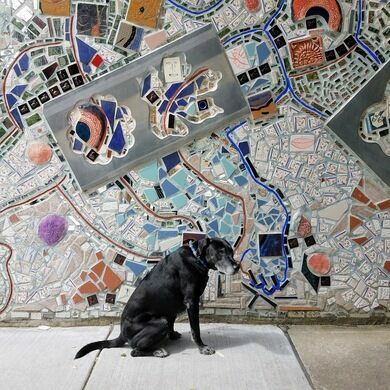 Zagar started working on the Magic Gardens in 1994 in the vacant lot near his studio. He spent the next fourteen years excavating tunnels and grottos, sculpting multi-layered walls, and tiling and grouting the 3,000 square foot space. The installation pays tribute to Zagar’s many artistic influences, as well as the events and experiences of his life. The installation, primarily consisting of found objects and contributions from the community, covers half a city block with myriads of tile, texture, and color. A walk through the labyrinth will reveal sculptures from Latin America and Asia, bicycle wheels from local South Street shop Via Bicycles, Zagar’s hand-made tiles, and mirrors of every shape and size. In 2002, the Boston-based owner of the once-vacant lot located at 1022-1026 South Street decided to sell the land in response to rising South Street property values. 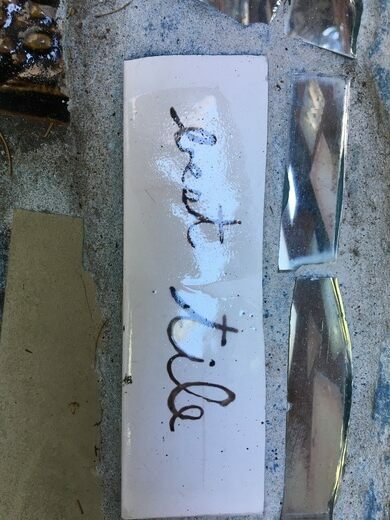 Unwilling to witness the destruction of Zagar’s neighborhood art environment, the community rushed to support the artist. 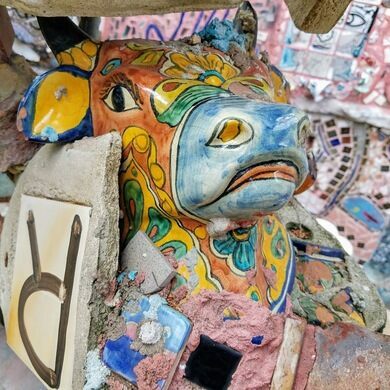 His creation, newly titled Philadelphia’s Magic Gardens, became incorporated as a nonprofit organization with the intention of preserving and promoting Zagar’s works at the site of the Magic Gardens and throughout the South Street region. 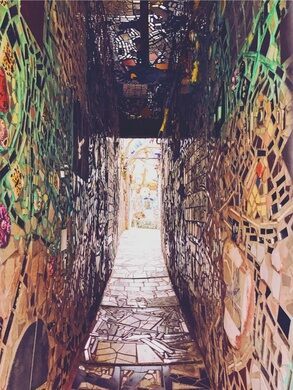 Philadelphia’s Magic Gardens are now a permanent art institution that is open to visitors throughout the year. Trained guides are available to lead tours of the Magic Gardens and Zagar’s surrounding public murals. In addition, PMG offers monthly mosaic workshops led by Zagar himself, and regularly hosts concerts, dance performances, and other public events. The site is closed on Tuesdays.